Keeps roots strong and clean for maximum efficiency, plant respiration and nutrient absorption. Prime Zyme ensures that your plants can deliver when the nutrients are needed the most! Enzymes Means Stronger Roots and Healthier Plants! Prime Zyme is an all natural product consisting of carefully formulated enzymes. With years of documented results showing how they help speed up the process of breaking down dead root material into reusable forms of nutrition for your plants. Prime Zyme also super activates microorganisms that help facilitate this process. The results are stronger roots that absorb more nutrients. Leading to plants with increased rates of photosynthesis and faster growth rates. Enzymes are necessary to all living things, they facilitate and speed up reactions for all growing biological functions. 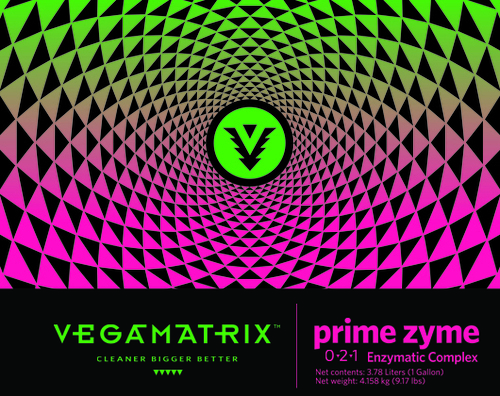 The carefully studied enzymes in Prime Zyme facilitate an all natural conversion of the dead roots and turn them into high potency minerals and sugars help maintain the vigor of your plants. The faster the breakdown of these dead roots and conversion to needed nutrients the more air and soil hydrology occurs. This also creates a barrier to root putrefaction and preventing pathogenic toxins, molds and other harmful organisms that will decrease your yields. Prime Zyme makes your soil environment cleaner and healthier by improving your plant’s vital root system. Healthy roots which are able to fully respire can better transport water and nutrients necessary to maximize your harvests. A healthy root system ensures maximum growth and bigger yields.